Amid A Struggling Economy, Cuban Real Estate Is Booming : Parallels Havana apartments with a Caribbean view run in the hundreds of thousands. Some houses are being sold for as much as $1 million. The real estate rush is on. 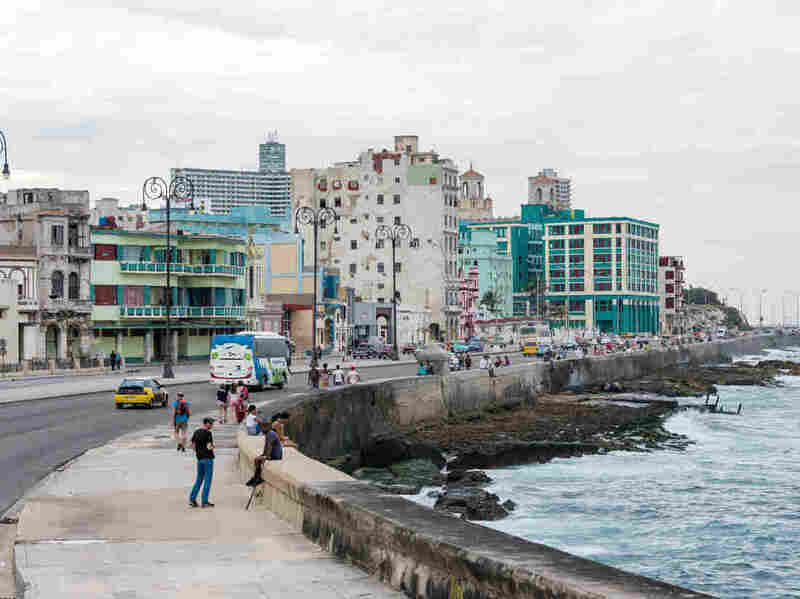 A view of the Caribbean is among the things attracting new buyers to high-priced Havana real estate along the city's famous seaside strip, the Malecón. If the old real estate adage holds true — it's all about location, location, location — then about 100 miles off the tip of Florida, it's boom time. The real estate market in Havana, Cuba, is roaring. The communist country is seeing its colonial-style mansions and Art Deco apartments selling in the hundreds of thousands of dollars. Add a Caribbean sea view or a prized spot in a pre-revolution, exclusive neighborhood, and the price can top a million bucks. The prices are soaring, along with speculation in this budding and risky all-cash real estate market. The real estate boom is taking place in select areas and is an anomaly in Cuba's otherwise sputtering economy, where austerity measures, electricity cuts and fuel shortages take a toll on everyday life. The contrasts are evident in a 12-story apartment building that sits between two rare, vacant lots on Havana's famous seaside strip, the Malecón. Residents call it the "Blue Unicorn." "That's because it's all by itself and painted marine blue," says real estate agent Yoandi Rizo Fiallo. And it's hot property in Cuba. Rizo walks through the building's crumbling lobby and goes up in the tiny, creaking elevator to the front door of his latest project. "Welcome," he says with a chuckle as we step into a well-lit, clean, modern, open, white apartment. The sensory shock is stunning when compared with the dilapidated and faded colors of the city's buildings in full view through a huge bank of panoramic windows on the back wall. A quick turn toward the front, and the bright blue Caribbean gives a stunning view. "Two years or three years ago, this apartment was probably half of the price it could cost now," says Rizo. Today's price is about $280,000. And the new owner, whom Rizo declined to identify, is putting another $50,000 into remodeling. He's added a bathroom to each of the three bedrooms and updated the kitchen with modern appliances. Rizo says the new owner plans to turn the once-rundown flat into a high-end bed and breakfast for the rush of tourists hitting the island. "Really, it is a wild market now," he says. Cubans are on a wild ride. Five years ago, President Raul Castro began letting homeowners buy and sell property. But it's only in the last year and a half, with warmer relations between the U.S. and Cuba that the rush on real estate really started. The U.S. trade embargo prohibits Americans from buying property on the island and Cuban law allows only residents to purchase homes. But that hasn't stopped foreigners from finding loopholes and fueling the frenzy. Juan Pablo Mugesia hangs out in back of the Blue Unicorn apartment building with a bunch of friends. He says at least once a week he gets a knock on his eighth-floor apartment door — mostly foreigners, he says, coming to make an offer. He lives with his brother, mother and father in a three-room flat and says his dad is holding out — for now. "If he gets a good price he'll go. If not, we'll stay," says Mugesia. About $250,000 in cash sounds about right, he says. After decades of living in crowded, dilapidated buildings and apartments too costly to maintain on average salaries of around $25 a month, many Cubans are cashing in. Musiega's neighbor, Luis Vargas, says no one's worried about foreigners taking over the place or the neighborhood changing. He says such sales help everyone get ahead. "Now the whole family can move out and do better," Vargas says. "With the earnings, each brother can buy a smaller house in a cheaper part of town and maybe get a car, start driving it as a taxi or start a little business," he says. Real estate agent Eduardo Perez says he gets daily calls from foreigners looking for a way into the market. He runs one of several websites advertising Havana real estate. Perez says he can help callers out if they have a relative here or a Cuban friend. "You have the money, I have the legal name in Cuba, and we can make the business," he says. On this day, he's going over the final details of a recently-purchased three-bedroom apartment in the pre-revolutionary exclusive Vedado neighborhood. Anaslay Serrano, the buyer, says there is no way she could have purchased this place on her meager salary if it wasn't for her husband, who lives in Belgium. "My husband is not Cuban and give[s] me the possibility to buy the new home," she says in English. It's about 1,000 square feet and is a post-revolution construction, so the rooms, including the kitchen and living room, are small. Serrano says she paid $28,000 for it and will put in another $5,000 to fix it up — and maybe even sell it at a nice profit afterward. Real estate agent Perez says Serrano can probably get about $40,000 for the apartment, if they do a nice job of making improvements. Everything is moving so fast these days, he says. "Business in Cuba is very young, all right, and for this reason, we don't know other ways in this business." Perez is learning the real estate business any way he can, mostly from the reality show Selling New York. He watches it on offline bootlegs of U.S. television shows that are sold weekly in Cuba. He's trying to come up with a catchy phrase in Spanish for "flipping" houses. Without rules and clear regulations, let alone title insurance, real estate agent Yoandi Rizo Fiallo says Cuba's market these days is risky. Many buyers are sentimental Cuban-Americans, he says — sons and grandsons reclaiming citizenship and buying up homes in their families' old neighborhoods without regard to value. "It's all about the heart and not the brain," he says. On top of that, the infrastructure in the city is poor, roads are bad and electricity and water are unreliable. And no guarantees the government won't reverse existing private-property laws. Back at the Blue Unicorn apartment high rise, with the quarter-million-dollar penthouse, it's started raining and a cascade of water pours down the stairwell. "The problem," Rizo says, "is that we are selling houses for a million dollars for a city that is not ready for millionaires."